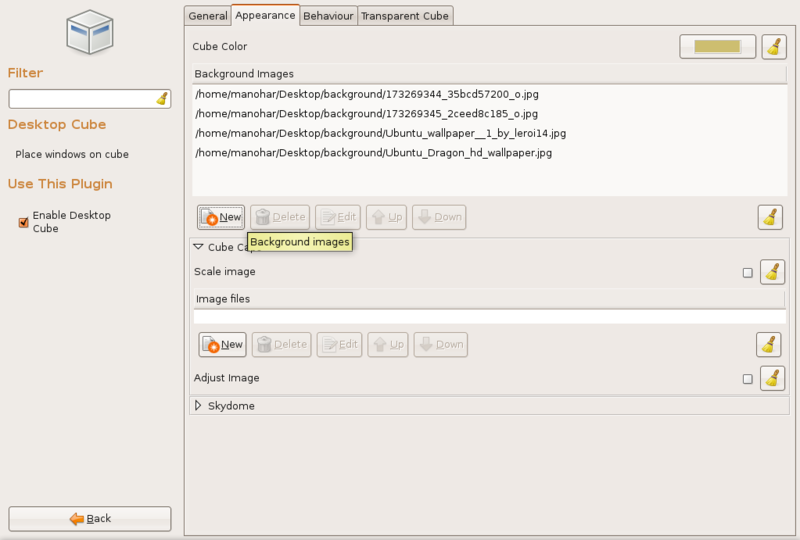 Let us set different wallpapers on different workspaces(desktop screens) in Ubuntu. I am doing this on Ubuntu 8.04 LTS. For this compiz should be installed. If you don’t have it installed already here is howto . Go to System>Preferences>Advanced Desktop Effects Settings OR press Alt+[F2] (OR open terminal) and type ccsm. This will open a window. Now click on Desktop Cube. Navigate to Appereance>Background images. Click New. Add all the images that you want to show in your workspaces. Add same number of images as much workspaces you have. Now open gconf-editor. To do so press Alt+[F2]. Write gconf-editor in it and click Run. 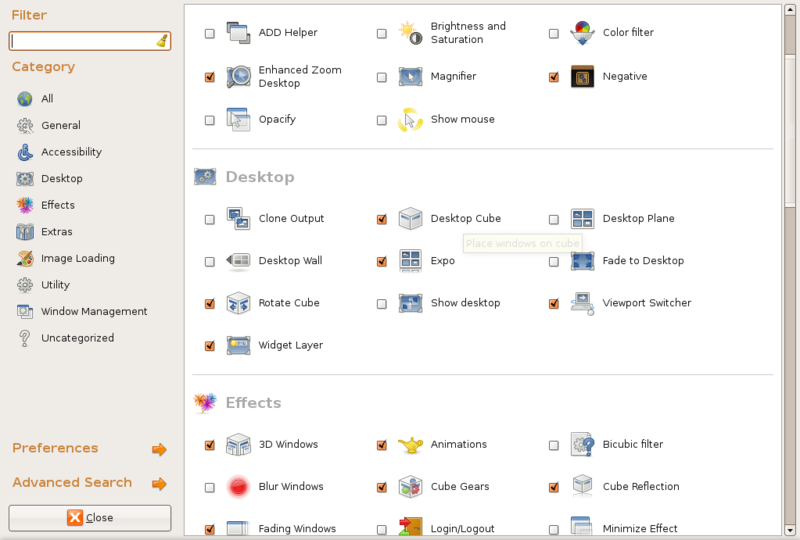 Now navigate to apps>nautilus>preferences. And unckeck “show_desktop“. Now its all done. Check all the workspaces. But you will notice that all the icons on your Desktop are gone and you can’t right-click on the desktop. Don’t worry you can find them here- Places>Desktop. If you save something on desktop they will also appear on that location only. Now this is what you will have to compromise on. Here is my Ubuntu 8.04 LTS with 4 different wallpapers. If you have any query please post a comment. I have this effect in my desktop and its great to do these tricks. I am talking about compiz fusion. Lets see how to install and apply some effects in Ubuntu. I am doing it on Hardy Heron. There are two ways to install compiz. 1. Using synaptic package manager. Go to Synaptic Package Manager (System>Administration>Synaptic Package Manager) and do a search for compizconfig-settings-manager. Check the install box and click apply. Now to add effects: Open System>Preferences>Advanced Desktop Effects Settings OR press Alt+[F2] (OR open terminal) and type ccsm. 1) Under “Desktop” check “Desktop Cube”. There are lots of settings inside this module, but for the time being leave it checked. 2) Underneath the desktop cube checkbox, check “Rotate Cube”. If all goes well, then holding down CTRL>ALT and the right hand mouse button should instantly zoom you out and display a three dimensional desktop! Mouse around and it will spin up and down and from left to right. The rest, I leave to you. enjoy. Hold the SUPER button (Windows key)then select the windows you want to group and then hit SUPER+G. Here is a sample video of my desktop with rotate cube effect. I hope this will enjoy Ubuntu and recommend your frends to use Ubuntu Linuz.